It’s the second Monday of the month and that means it’s time for our monthly blog group challenge! 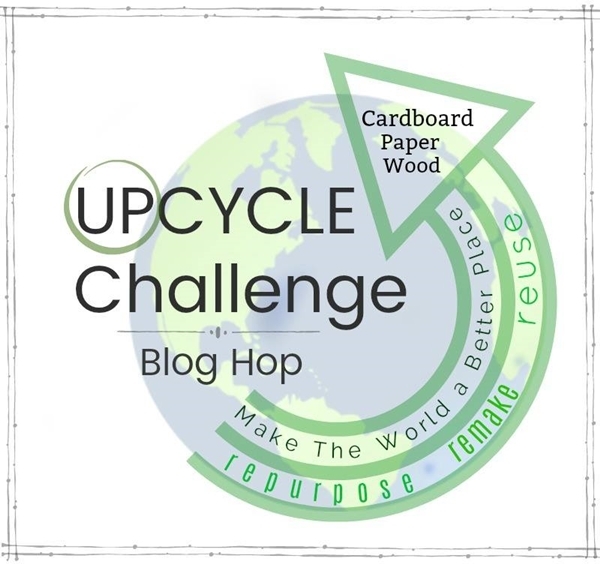 This month we were challenged to create a project using cardboard, paper, or wood for our upcycle challenge. When I’m looking for an upcycle project, I often visit my local Goodwill store to have a look. It’s almost always a great source for items that need a makeover to give them new life. 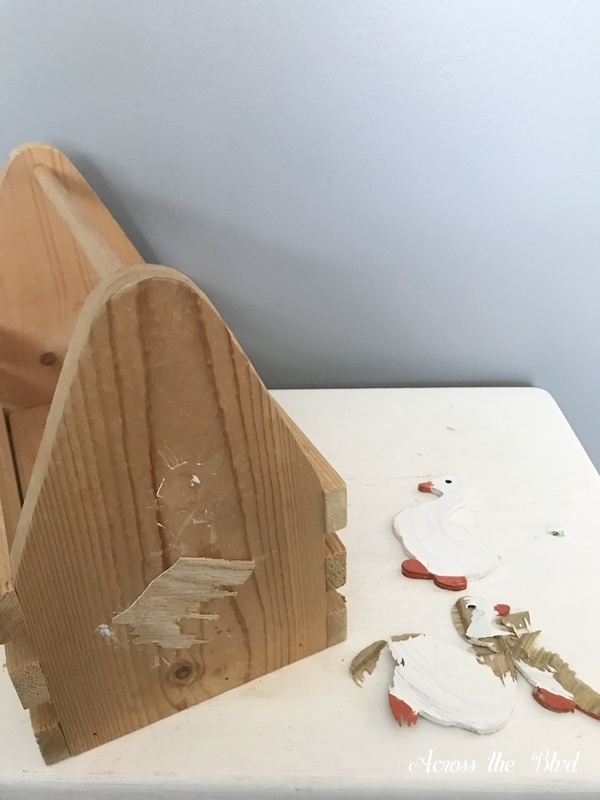 I found a wooden tool caddy that was straight out of the 80s, adorned with those not so lovely 1980s ducks. It got a fun, peacock inspired makeover to go with the decor of my home office/craft space. Finding items that have seen better days or items that I can give a new use to is always a fun challenge. This month we have a great group of bloggers participating. We hope you’ll visit their links by clicking below or through the Link Up at the bottom of the post. This tool caddy has a burned on marking on the bottom that reads, “Hand Crafted by Fred Buckles.” How many of you had ducks in your decor during the 80’s? I did! My kitchen had ducks all over it. This tool caddy had one on each side. Whatever glue that was used, it was strong. One of the ducks popped off pretty easily using a flat head screw driver to pry it off. The other one was stubborn. 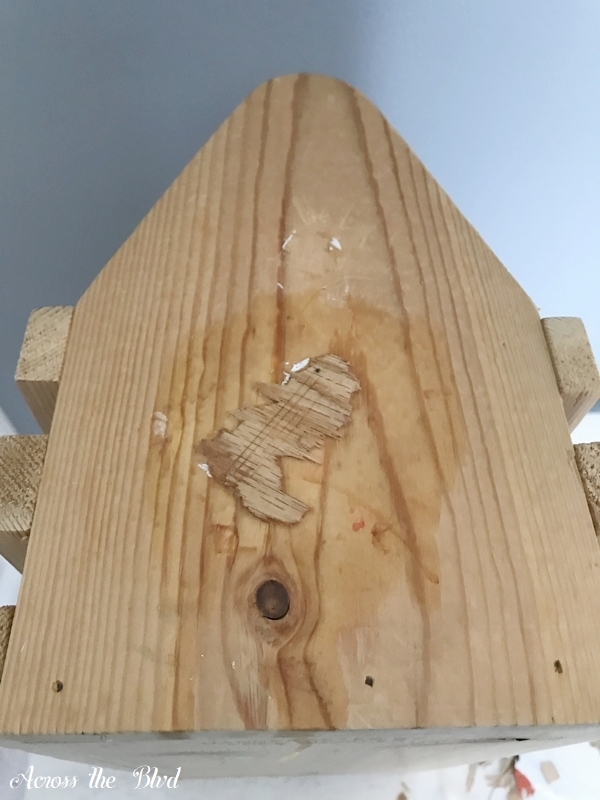 It finally came off in bits and pieces, leaving some of still adhered to the wood. After searching on line for methods to remove glued on wooden pieces, I tried using acetone nail polish after reading that it would work. It did not. It might have worked if I could have removed more of the wood. Using my palm sander was the best option at this point. 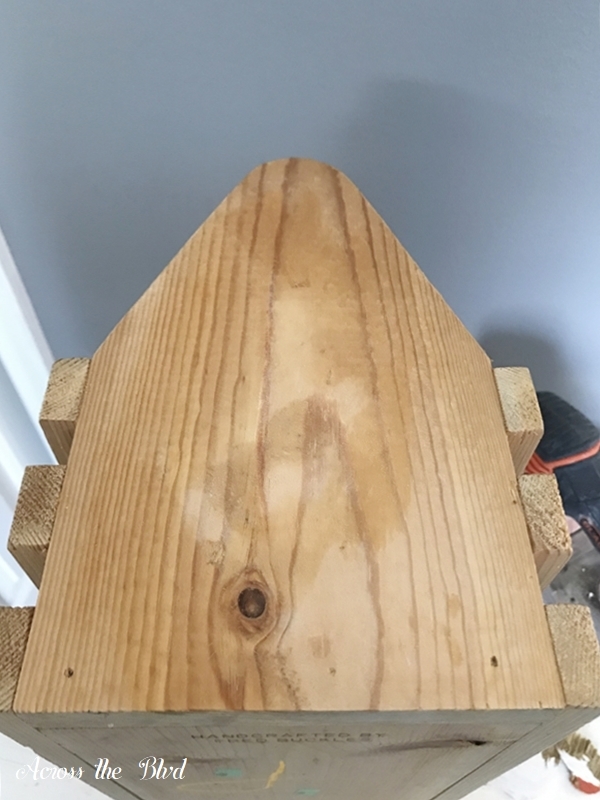 I carefully sanded the spot with the remaining wood until I had a smooth surface. The caddy was cleaned with TSP and was ready to be painted. 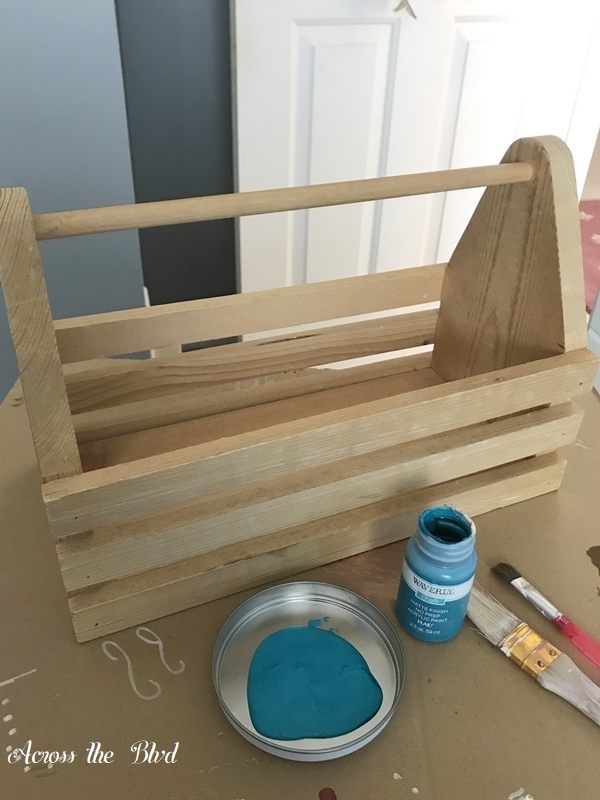 *Tip* Lids from cans, plastic containers, or jars are all good items to use for holding paint for small paint projects like this. I keep a stash of them in my garage and always have some on hand when I need one. After applying two coats of Waverly Chalk Paint in Peacock, I gave the caddy one coat of Polycrylic Spray Finish. Once that dried, it was ready to embellish. I used a jeweled strip on a few other projects in my Office/Craft space room makeover. If you missed that series of posts, you can have a look at this post with links to all of the projects I completed for my Home Office/Craft Space Makeover. I added the jeweled strips along the sides and the bottom of the caddy. These are glued in place. The finishing touches were to add a peacock feather and a strip of self adhesive jewels to the front of the caddy. 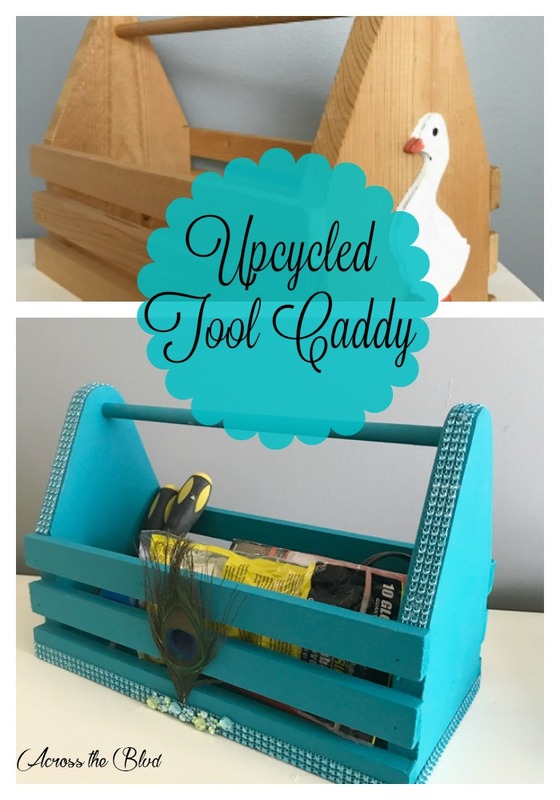 I love that the tool caddy went from 1980s country to modern and glam. This is a handy and useful item to have for some of the small tools that I use frequently. It keeps things organized and it freed up some space in some drawers in my craft desk. It’s always great to find thrift store items that can be given new life! Want to get the latest from Across the Boulevard? Sign Up Below! Want more Upcycle Ideas? Visit the links below for more inspiration! Thanks, Marci! I was happy with how it turned out and it matches my craft space now. 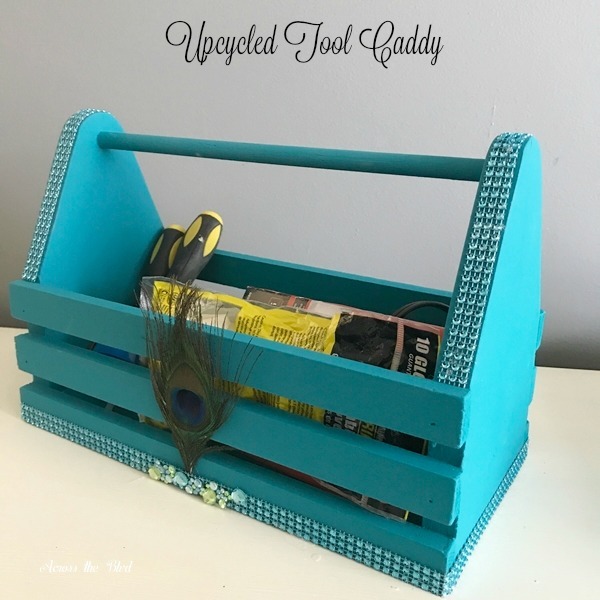 Leave it to you to transform a plain tool caddy into one that’s blinged out, Beverly!!! This is fabulous! Great job! A little bling is usually a good thing! 🙂 Thanks, Gail! That is good looking and using my happy colors.You saved the world from another discarded Duck. I love those colors, too. It makes my craft room/home office such a cheerful place to work. 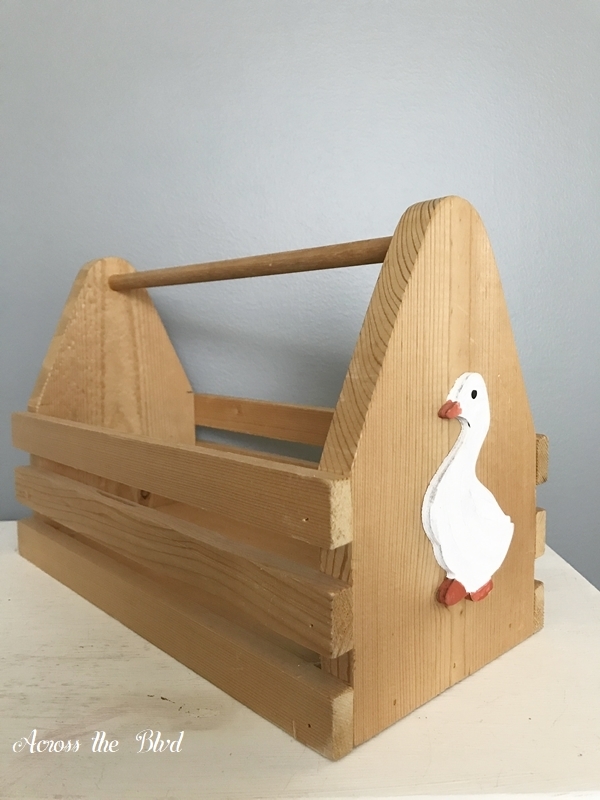 I was glad to find a way to give the tired old duck caddy new life. Thanks, Michele! Wow – taking that from country goose to glam peacock is quite the transformation! i really love that jeweled strip (just what I’ve been looking for for a couple projects)! 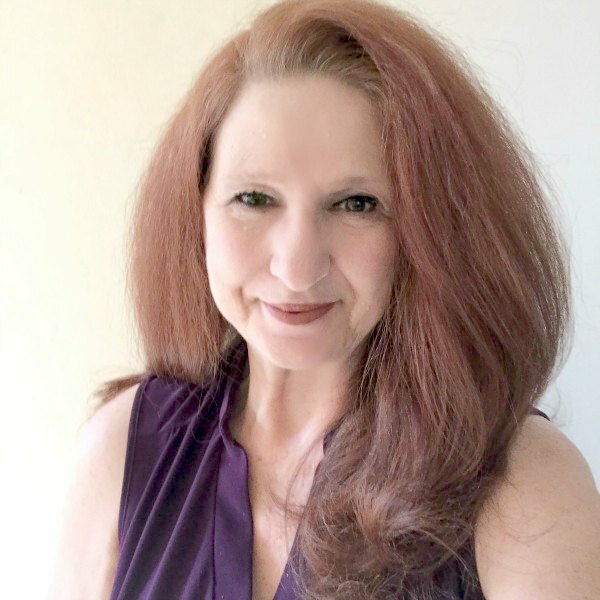 I love that description for this, Lynda! Thanks! You can find those jewel strips at the Dollar Tree. Beverly, I love finding great items at the thrift stores to transform in to useful items. The caddy is a great size for the craft room. You did a lovely job making this piece fit in perfectly with your craft room/office! Pinning to Share! I do, too! This was just right for holding small tools that I want to keep handy. Thank you! Once I got rid of the ducks, it was an easy makeover. Thanks for sharing! how pretty! i love that peacock color! and i think i had a duck or two in my decor in the 80’s! Thanks, Roseann! I think everyone had a duck or two back then! Too funny about the ducks! My mother had duck dishes, canisters, dish towels, pot holders, and more! Also, i had an Easter basket as a child that was a very similar shape as your caddy. It was painted white with a beautiful rabbit face on the end. It had my name painted under the face. 😉 I love your project and how you really transformed the basket from dated to modern! Those ducks were in almost every home during the 80s! It’s great to have memories brought back. Thank you, Kristin. I was happy with the find and its makeover. Beverly, I see those wooden caddies at thrift stores all the time. In fact, I recently saw one with not ducks, but bunnies. And I’ve seen one with pineapples, and I usually pass them by. But I’m inspired to get one & do a makeover like you’ve done. It’s so pretty with the updated color and the bling. Good thing you were persistent in removing the duck! This was the first one I had seen that was still in really solid condition. I was pleased to have found it. I’m delighted to have inspired you. Thanks, Florence! Yeah, I’d take bling and glwm over country ducks and geese any day, lol! I love that turquoise color you chose, too. Thanks, Marie! I love the turquoise paint, too. It’s added a nice pop of color to the space. Very cute! Love the peacock feather! Thank you, Sylvia! 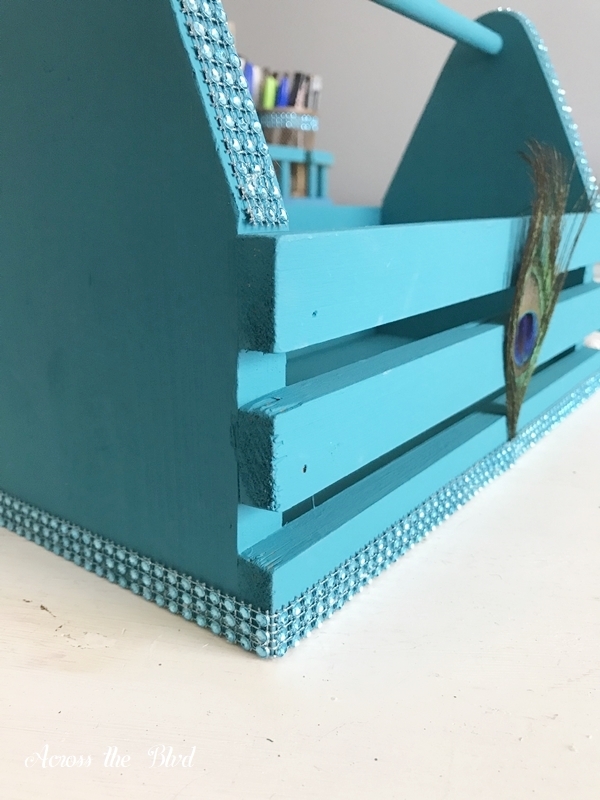 I’ve enjoyed using lots of peacock accessories in my office/craft room. 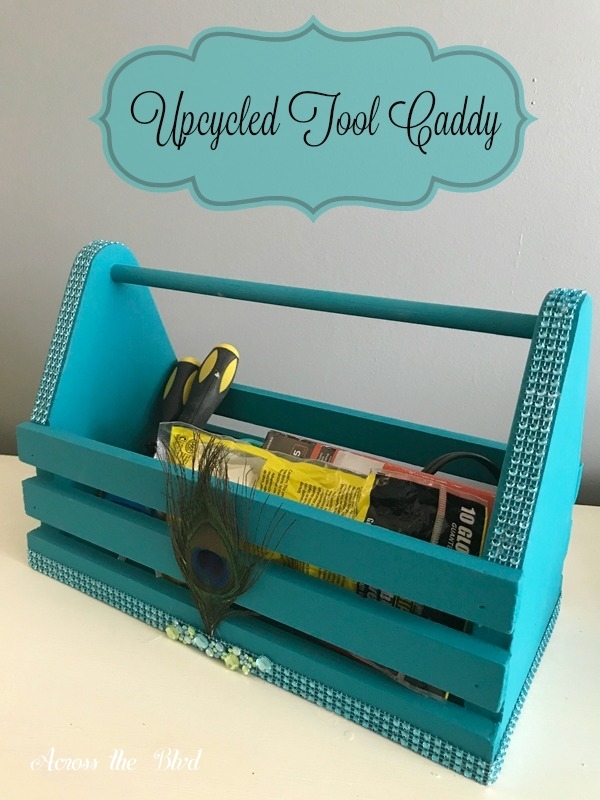 Great idea, love the color you chose for the tool caddy! also pinned. Thanks, Candi! This has become one of my favorite colors in recent years. Thanks so much for the pin! What a great idea! The finished product is very pretty! Thank you fOr sharing at #BloggingGrandmotgersLinkParty. Thanks, Lori! Thanks for the party, too.